Be sure to SHOW ALL WORK on a seperate piece of paper! Ms. Garza buys spices to make one batch of Garam Masala. 1. 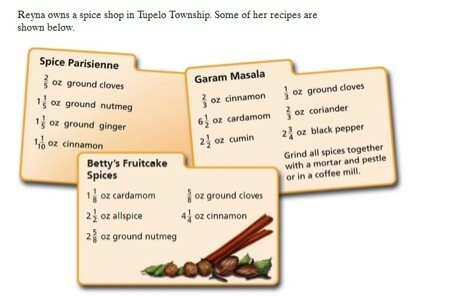 How many ounces of spices does Ms. Garza buy? a. Suppose she already has enough cinnamon and coriander at home. How many ounces of spices does she buy? b. Show a way to determine the answer using subtraction.